It didn't make sense, Margaret had been to the dentist for a simple filling; a little decay had been removed and the new filling seemed fine, but pain from same area was getting worse. Al, a man in excellent physical condition, a coxswain on a crew team and the coach of a soccer team would have chronic headaches and what seemed like “post-workout” pain in his head and even his neck. Elizabeth would wake every morning with soreness on one side of her jaw, a feeling like her teeth had been in a vice and her husband said that she was grinding her teeth so loudly in her sleep that the noise woke him up. These three people suffer from seemingly different conditions, but in fact, all of their complaints are hallmarks of “Temporomandibular Disorder” or TMD. This condition is sometimes referred to as “the great imposter,” because the similar character or nature of the discomfort or pain is the same for many differing conditions. Let's try to simplify the situation to make it understandable: the temporomandibular joint is formed between a small depression in the temporal bone of the skull, into which an almond shaped structure, the condyle of the lower jaw or mandible, neatly fits. When you open wide you can feel the joints working by placing your fingers in front of your ears, that's right you have two TM joints, one on either side, and it is the lower jaw that does the moving. It is a special joint in the body in that it has a small disc between the two bones, which allows forward and sideways movement. Like other joints the temporomandibular joint is stabilized by ligaments and moved by muscles. These structures allow the joint to move and also stabilize it during normal movement or function. 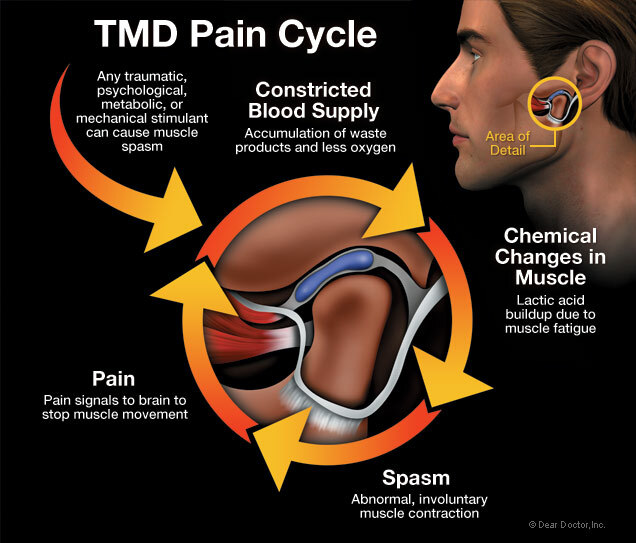 The term TMD means “Temporomandibular Disorder”; it refers to problems inside the temporomandibular joint and the muscles attached to it. You may be familiar with the term TMJ as it was formally known and is still in common usage. Today, most dentists prefer TMD because it is more accurate than TMJ and is therefore used in this article both for simplicity and consistency. What really is the cause of the pain? Simply put, the surrounding structures in the jaw “system” including, the teeth, air sinuses, even neck and back muscles share nerves with these joint structures so that when a problem arises in anyone of them “the great imposter” may be evident. The nerves react by telling you something in the system is wrong, and they let you know by saying “pain.” The pain most commonly is caused by the muscles of the temporomandibular joint going into spasm and limiting your ability to open and function or even eat normally. 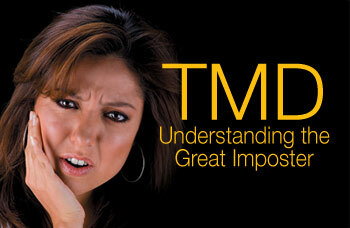 TMD can affect anyone at any time, and presents with a wide range of similar symptoms. As you will also see momentarily, TMD has a uniquely social character to it, which means that a person's emotional or psychological state, or state of stress plays a big role in TMD pain. Stress manifests physically in different ways, in some people it causes skin rashes, in others it causes stomach or bowel disorders; what is most commonly seen in dental patients is TMD manifested as clenching or grinding habits. These habits are many times completely subconscious until pointed out either by a dental professional or a “sleeping” partner. The pain may come and go depending on the level of stress, and if that's the way you deal with stress it may come back when you're next stressed, in other words TMD can go in cycles. It is common for people to find themselves clenching or grinding when stressed driving in traffic or during vigorous exercise, envision Lance Armstrong racing for the finish line of the Tour de France. 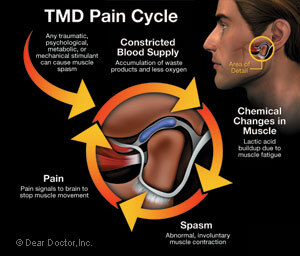 But even acute injuries, like a blow to the jaw, as occur in sports can cause TMD pain. When the force generated by the teeth coming together becomes excessive and habitual, it is called “parafunctional,” that means outside the normal range. Such high forces to the joints and associated structures can become damaging; the muscles go into spasm and “guard” the joint to protect it and it is felt as TMD pain. If muscles have been overused during the day as in the case of Al, the soccer coach, they might go into spasm even during sleep. Even the sleep position itself may lead to stretching or compression of parts of the neck or jaw. Poor sleep and position can actually aggravate TMD problems. In this most common cause of TMD, making the TMD sufferer aware that their subconscious clenching or grinding habits may be aggravating their symptoms and related to their stress. This diagnosis is largely dependent upon a good past dental and medical history taken by the dentist. This step in the discovery process can document seemingly unrelated past incidents which can turn out to be the main cause of the problem. References:  American Academy of Orofacial Pain. JP Okeson, ed. Orofacial Pain: Guidelines for Assessment, Diagnosis, and Management. Chicago, IL: Quintessence Publishing Co, Inc; 1996. Lund JP, Lavigne GJ, Dubner R, et al. Orofacial Pain: From Basic Science to Clinical Management. Chicago, IL: Quintessence Publishing Co, Inc: 2001. Management of Tempromandibular Disorders. NIH Technology Assessment Statement. 1996; April 29 - May 1:1-31. Stohler CS, Zarb GA. On the management of temporomandibular disorders: A plea for a low-tech, high-prudence therapeutic approach. J Orofacial Pain. 1999; 13:255-261. Syrop SB. In: Peterson LJ, ed. Principles of Oral and Maxillofacial Surgery. Philadelphia, PA: JB Lippincott Co; 1992: 1905-1931, chapter 67.